She lifted the lid, and a plume of white, onion-scented smoke rose to fill the air over our table. 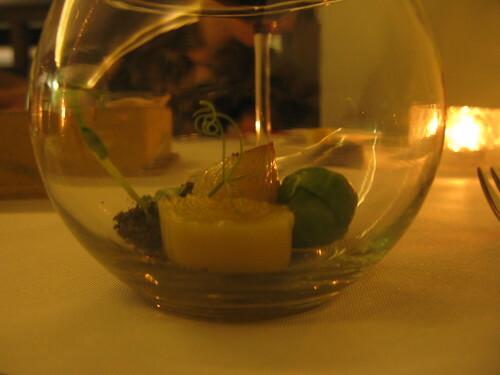 Left behind was a perfect terrarium of a dish: a single sprout grew from a bed of black olive powder, winding around tiny bushes of leek and baby onion, past a pool of brussels sprout puree. We stared in wonder for a minute before trying the smoky, earthy flavours. 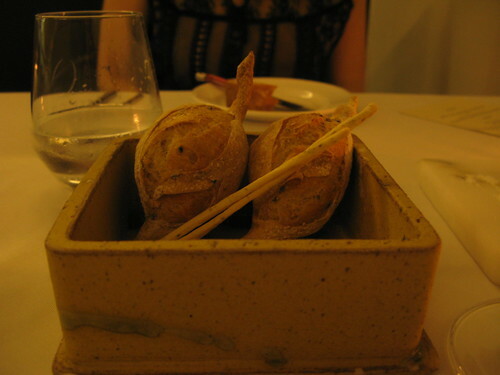 We’d read about Kazuya online, and decided to visit last May to try their seven-course tasting menu. 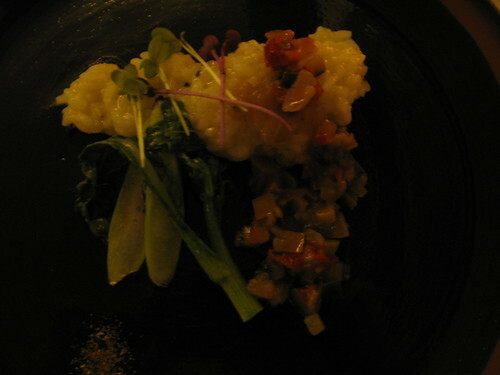 And this was my experience, too: every dish was constructed with care and presented with respect. I was dining with a vegetarian (and more recently, returned for another dinner with meat-eating friends), but didn’t feel like my experience was any less full or considered than theirs. On the contrary, this was some of the most creative, interesting and delicious vegan food I’ve eaten, and Kazuya was easily my favourite food-related discovery of 2013. Through the evening, the food was stunning – full of perfectly-balanced flavour and surprise – the service delightful and the surroundings both elegant and comfortable. We ate slowly, stretching the small courses over hours and savouring every taste. 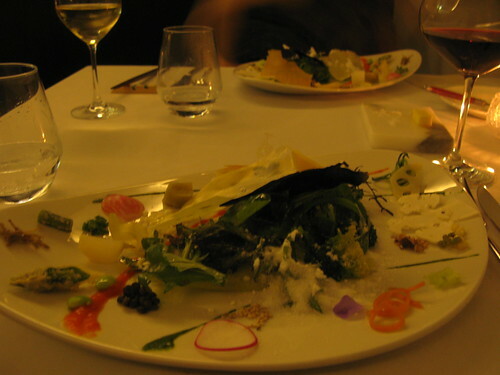 and Kazuya’s signature dish, “Texture” – a plate of thirty different vegetables prepared in every way possible: powdered, pickled, shaved, tempura-battered, dehydrated in crisp sheets, raw, blended into pastes. When I returned more recently, the tasting menu looked completely different – seasonal ingredients are used, so the menu changes often. Though the restaurant hasn’t felt crowded when I’ve eaten there, it has been full; Kazuya is often booked to capacity, so you need to make a reservation well ahead of time. Tell them that you’re vegan, and any other dietary requirements you might have, when you book. Kazuya is at 193 Symonds Street, Eden Terrace, and is currently open for lunch on Thursdays and Fridays (12-4pm) and dinner on Tuesday-Saturday (6pm-late, with last orders at 9.30pm).